how warped is your reality? + how to become an authentic work of art (daily hot! quote) – AmyJalapeño! 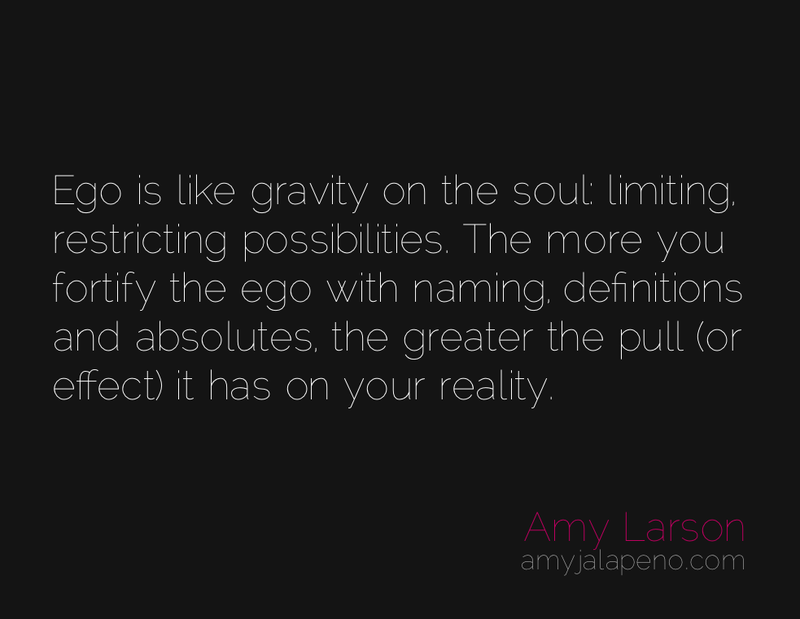 Ego is like gravity on the soul: limiting, restricting possibilities. The more you fortify the ego with naming, definitions and absolutes, the greater the pull (or effect) it has on your reality. Ego relies on definitions and naming, absolutes and certainty. If you require any of these to be happy, content or to feel safe, you are operating (or living) from ego. This is where struggle and suffering are gifts. They shake up mental structures; and if we are lucky, tumble them to the ground. We are more than a name, more than our beliefs, more than what others think about us. We are more than our religion, our level of education and status, more than our successes and failures. We are made of something lasting and immortal that is continuously and forever changing form. It is when we realize this, when we let it sink in, that we truly become a contribution to our communities, our friends, family and closest relationships. And when we do (realize this) our lives become authentic works of art. August of 1984 during a weeklong experience course someone finally got through the cloud and I heard them say, “Michael, get out of your head!!! Come out and play with us! !” That was day two. I still have a tendency to go into my head. Nothing in there by the way. It isn’t even safe. All of my best decesions that generated breakthrough happened with me ‘out here’ and not in my head. Presence is ‘our here’ and life only happens in the present. Learning to operate from the ‘gut’ and the heart instead of the mind is life long. Thank you Amy!